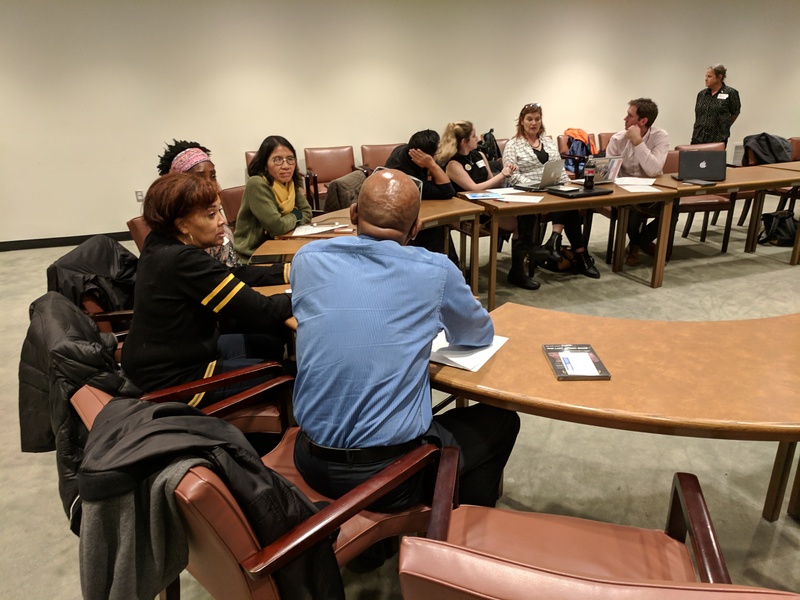 On 6 November 2018, public high school teachers from across New York City trained and strategized at United Nations Headquarters to engage effectively with their students on nuclear weapons and disarmament-related topics. The 27 educators were part of a daylong workshop that civil society advocates have hosted every year since 2012 in partnership with the United Nations Office for Disarmament Affairs (UNODA). Hibakusha Stories, an initiative of Youth Arts New York, seeks to inspire action for disarmament among younger generations by helping them more fully understand the firsthand experiences of the “hibakusha”, individuals who survived the 1945 atomic bombings of Hiroshima and Nagasaki. 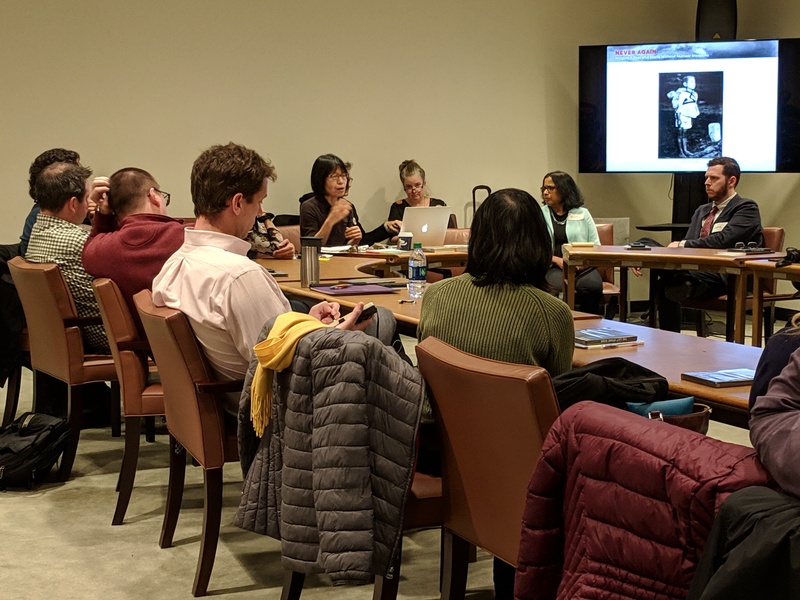 The event, entitled “Nuclear Weapons Today: From Hiroshima to Nagasaki to the Ban Treaty”, opened with a guided tour of artifacts from the bombings held on permanent display in the UN General Assembly Building. After completing the tour and listening to introductions by Hibakusha Stories and UNODA staff, attendees heard a briefing from Ms. Ray Acheson, Director of the “Reaching Critical Will” disarmament project of the Women’s International League for Peace and Freedom, about developments in the seventy-third session of the General Assembly’s First Committee on disarmament and international security. Ms. Acheson, who is on the steering committee of the International Campaign to Abolish Nuclear Weapons (ICAN), also discussed a long-running global effort to focus political and public attention on the grave humanitarian risks posed by nuclear weapons. ICAN—an international advocacy coalition comprising hundreds of partnered non-governmental organizations around the world, including Hibakusha Stories—received the 2017 Nobel Peace Prize for its role in this Humanitarian Initiative and in the achievement of the Treaty on the Prohibition of Nuclear Weapons (TPNW). After taking questions, the ICAN representative surprised the participating teachers with an opportunity to view and pose for photographs with the Nobel Peace Prize medal. Dr. Kathleen Sullivan, a professional disarmament educator and the Director of Hibakusha Stories, expressed hope that handling the medal would give the educators a heightened sense of their personal stake in global nuclear disarmament efforts. The teachers then viewed “If You Love This Planet”, a publicly available animated short film drawing on remarks delivered by Ms. Setsuko Thurlow, a survivor of the Hiroshima atomic bombing, on the occasion of the TPNW’s adoption on 7 July 2017. Following the film, the group concluded its morning session by hearing the in-person testimony of Ms. Miyako Taguchi, a second-generation hibakusha advocate, about the experiences her parents had endured as a result of the atomic bombing of Nagasaki. When the teachers reconvened for the workshop’s afternoon session, Dr. Sullivan invited them to participate in the “BB” demonstration, designed to highlight the devastating power of the world’s nuclear arsenals. The meeting then broke into small groups where educators shared their views about the current global role of nuclear weapons and, in this context, how they could effectively teach their students about nuclear-arms issues. The event concluded with an exchange of views between the groups and an overview of several disarmament education resources. The professional development workshop was the seventh event of its kind held on the date of the United States election, when public school teachers in New York City receive time to participate in continuing education activities. In the demonstration, which uses round metallic pellets known as BBs, participants listen as a small pellet drops into a large tin can, producing a small “ping” said to represent all the firepower used during World War II, including the nuclear bombs dropped on Hiroshima and Nagasaki. That sound is followed by the crashing noise of 2,225 pellets falling into the same container, representing the potential impact of the world’s present-day nuclear arsenals.